This is not a complete list of the local men (and women) who served in the First World War. Please click on the links shown on the left to see other information. This page is simply a list of the men from the Thornbury area about whom we have further details copied from service records and newspaper reports. We have attempted to link each person with their family using census and baptism records on Scribes Alcove website for the purposes of linking each of them to a Thornbury family. Please let us know if you have any information about a relative which can be added to the website. Arthur Richard Matthews – was born in Midsomer Norton in 1891. He was the son of Edwin Matthews, a coal hewer and his wife, Rosina. By the 1911 Census Arthur had started working in the coal mine with his father. He was a carting boy. The family were living at 4 Park View Back Road Midsomer Norton. We don’t know what led Arthur to come to Thornbury, but in 1913 he married Lily Morgan there. During the War Arthur served as a Private in the Worcestershire Regiment 9th Battalion. He died of wounds in Mesopotamia on 13th January 1917. He was buried in Amara Cemetery. His record shows his home address was in Thornbury and Arthur is listed on the war memorial at St Mary’s Church in Thornbury . William and Herbert Pearce – Bill and Bert were brothers, the sons of Thomas and Sarah Pearce. They were living in Castle Street when they applied for exemption from military service in 1916 on the grounds th at they were needed by their employers. Bill was a baker’s roundsman working for Albert Edward Thompson. The records of the gifts sent at Christmas to Thornbury men serving in the forces show that Bill was in Maidstone in 1916 and in Mesopotamia in 1917. Bert enlisted in the Labour Corps on 5th August 1916. He was described as a butcher’s delivery boy from Castle Street, Thornbury. He was aged 18 years 5 months, height 5ft 6.5 inches, weight 140lbs, chest 37.5 inches with 2.5 inch range. He was sent to France on 10th November 1916. Percy Levi Pearce – was baptised in Thornbury on 9th August 1899 the son of George Pearce a labourer and his wife Emma who were living in Morton. The 1901 Census shows that George Pearce, Percy’s father, was a market gardener and that at the time of the Census Percy was the youngest of eight children. The 1911 Census for Newton near Thornbury shows that the family actually had thirteen children but that two of them had died. By 1911 Percy aged 14 was working as a farmer’s boy. When Percy was 19 years and three months and working as a carter he enlisted for the army in June 1916. Percy joined the Labour Corps of the Gloucestershire Regiment. He was awarded a Victory Medal and a British Medal. Percy died on 18th August 1949 at his home at Fewsters Farm in Kington. Richard Sully Ponting – was baptised on 17th October 1873, the son of William Harris Ponting and his wife, Jemima Spiller (nee Sully). He was a draper’s apprentice living in Teighmouth in the 1901 Census, but he was back in Newton near Rockhampton living with his parents at the time of the 1911 Census. He served as a Private with the 2/6th Battalion Gloucester Regiment during the First World War. In 1917 Richard married Ada Eleanor Bruce Trotman in the Cheltenham area and their home was Oakdene, Albany Road, Cheltenham. He was killed in action on 2nd December 1917 in Cambrai area of France. He is listed on war memorials in Cheltenham and Thornbury. Herbert Ernest Poole – was born in 1876. He lived at Grovesend near Thornbury. He was a farm labourer near Falfield in the 1911 Census. He enlisted in the army in 1917 when he was 40 years and five months of age. He served with the Royal Engineers in France. He was discharged from the army on 3rd May 1919 and was categorised B3 because of deafness and poor eyesight. He died on March 4th 1928 aged 51 years. He was buried in the cemetery in Thornbury. Jesse (Nelmes) Pritchard – Jesse was baptised on 11th January 1885 under the name of Jesse George Nelmes, the son of Thomas Nelmes, a labourer and his wife Elizabeth of Crossways. Thomas Nelmes had married Elizabeth Church in December 1879. The disparity in surname appears to stem from the fact that Jesse’s father Thomas was baptised in December 1854 in his mother’s maiden name of Nelmes as his parents (Jesse Pritchard and Ann Nelmes) were not actually married until 3rd May 1856. Thomas and family seem to have been known as Pritchard and appear as such in Censuses. It was only in the church records that the surname Nelmes is used for Thomas and his children. It is even possible that Jesse never knew that he was baptised as Jesse Nelmes. Jesse Pritchard was a Private serving with 7th Battalion B Company, Gloucester Regiment when he died on 5th November 1915 aged 29. He had been a farm labourer living at home in 1911 Census. He enlisted in August 1914 and was sent to the Dardanelles in June 1915 and wounded in August. After being in hospital for some time he was sent back to the firing line again where he contracted dysentery which caused his death. The burial record shows he died in Reading and his remains were returned to Thornbury where his funeral took place and he was buried in Thornbury Cemetery. At the same time as Jesse died, his brother, Frederick Pritchard (who was baptised Frederick Reginald Nelmes) who was serving in the Royal Marines was lying in the Haslar Hospital in Gosport, Hants. William John Purnell – born in 1892, the son of Stephen and Mary Jane Purnell. At the time of his birth his father was licensee at The Black Horse, Gillingstool. By 1901 the famly had moved to live in Bristol. On 3rd September 1915 William John enlisted as Private in the 8th Battalion South Lancashire Regiment at Abertridwr, Glamorgan. He was described as a miner aged 22 and 5ft 6.25 inches, 127 lbs, 37 inch chest when expanded, blue eyes and brown hair. William was killed in action on 2nd August 1917. His name appears on the memorial at the Menin Gate, Ypres. Levi Purnell – enlisted into the 3rd Gloucestershire Regiment on 7th March 1906 when he was 18 years old and a stable hand. Previously he had served in the militia. His parents were Thomas and Maria Purnell of Horseshoe Lane. William Riddle – was baptised William George Cole Riddle in Thornbury on 3rd December 1882. He was the son of Luke Riddle, a labourer and his wife, Mary Jane who lived at Milbury Heath. In the 1901 Census he was a grocer’s porter living with his mother in Hackett Lane. His father was a pauper inmate at the Workhouse and he died in 1902 aged 43. His widowed mother married George Longden in 1904 and they settled to live at Hollytree Cottage, Grovesend. The 1911 Census shows William had moved to Wales, where he was railway platelayer, boarding in Blaina, Monmouthshire. In 1915 he returned to Thornbury to marry Catherine Alway, but they went to live back in Bedwellty, Monmouthshire which is where she died in 1916 aged 27. Following Catherine’s death, William enlisted in the South Wales Borderers in 1916. He was a repairer’s assistant living at Ty Bryn Road, Abertillery at the time. He was serving as a Private in 16th Battalion, Royal Welsh Fusilliers when he was killed in France on 8th October 1918. He was buried at Bois-Des-Angles British Cemetery, Crevecoeur-Sur-L’Escaut. Ivor Morgan Rodney was born on 19th June 1896 and baptised in St Mary’s Church in Thornbury on 2nd August 1896. He was the son of Robert William Henry Rodney and his wife Henrietta Katherine who lived at The Parks in Thornbury. The 1911 Census shows that he was educated at Repton in Derbyshire. He later went to Sandhurst. In 1915 he became a second Lieutenant in the Dorset Regiment. However his military career was one of the very early airmen. He qualified as a pilot on a Maurice Farman biplane at the Military School in Farnborough on 3rd February 1916. In 1917 he joined the wireless school in Brooklands. He served in Iraq in 1919. In 1923 he was promoted from Flying Officer to Flight Lieutenant. In 1925 the Air Council recognised his voluntary experimental work on short wave wireless telegraphy. When he travelled to Canada from New Zealand on the SS Makura in 1929 aged 33 he gave his home address as The Parks in Thornbury. In 1931 he married Althea Caroline Winifred the daughter of Sir Gerald Wollaston and they had three daughters. In 1937 the London Gazette announced that he was one of the Squadron leaders promoted to Wing Commander. Group Captain Ivor Morgan Rodney O.B.E. died at his home at Well House Great Amwell in Ware in Dorset on 16th June 1954. William Sainsbury – William was born in 1872, the son of William Sainsbury and his wife, Maria (nee Cook). The 1901 Census shows he was serving as a private in the Grenadier Guards based at Caterham. We do not know how long nor where William served. His military records available on the Ancestry website show that he was living at 62 Burford Street, Hoddeston when he rejoined the forces in 1915. He was then aged 43. Initially he joined the Hertfordshire Regiment Reserves but transferred in 1916 to the Royal Defence Corps 6th Battalion. We don’t know where he served, but he was noted as being in the ‘Eastern’ theatre of war. 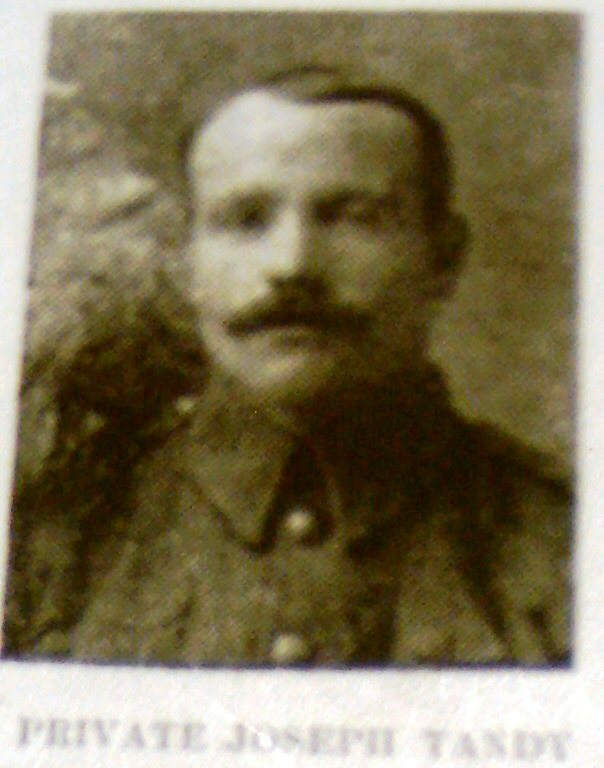 He was made Lance Corporal in 1916 and Corporal in 1917 and demobbed in March 1919. Henry Edward Savery – was the son of John Charles and Fanny Savery who lived at 3 Bath Road in Thornbury. He joined the Royal Berkshire Regiment (also known as Princess Charlotte of Wales’s Royal Berkshire) in November 1915. At the time he enlisted he was 27 years old and was a baker who lived at Gillingstool near Thornbury. He was baptised at St Mary’s Church in Thornbury on 13th February 1889. His army record shows that he married Beatrice Skuse at Thornbury Parish Church on October 29th 1913 at which time he was living in Gillingstool. Their first child Francis Fanny was born at Crossways on 13th December 1913. By the time their second child Henry John was born on 19th April 1915 the family lived at Gillingstool. A third child, Beatrice Ellen was born on 27th October 1916 in Thornbury. When their last child was born, Henry was in France. He joined the British Expeditionary force on 26th September 1916. He was sent home on 11th December 1918. He was awarded the British Medal and the Victory Medal which he may have been issued with by the East Kent Regiment (the Buffs). Martin Skuse – was born in Thornbury on 17th August 1888, the son of Thomas Skuse, a general labourer and his wife, Emma. The 1911 Census shows Martin as a farm labourer still living with his parents at Siblands. On 27th April 1912 he sailed from Liverpool to Quebec on SS Megantic, together with his brother Austin. On 23rd October 1915 he enlisted at Welland, Ontario. He joined the Canadian Infantry (Central Ontario Regiment) 58th Battalion. His service record shows he was single, had previously been a labourer and had served for 6 months with the 44th Regiment. It notes that his brother Austin was living in Toronto and another brother, George, was in Walkerton, Ontario. He was killed on 27th January 1917. He is buried in Ecoivres Military Cemetery, Mont-St Eloi, France. Joseph Skillern – we believe that Joseph was probably the son of Thomas Skillern, an agricultural labourer and his wife Mary Ann (nee Jones) and he was born in Awre in the Forest of Dean, Gloucestershire. In the 1891 Census Joseph was living with his parents in Awre. Joseph’s father died in 1895 and by 1901 census Mary Ann and her children had moved to Charfield. Hubert Tandy Hubert was baptised on 27th March 1892 at Grovesend. He was the son of a carter called Lewis Tandy and his first wife Harriett. He appears with them in Grovesend in the 1901 Census. The 1911 Census shows that he was enlisted in the Second Battalion of the Gloucester Regiment and serving in Malta. He served with the Gloucester Regiment in Northern France and the Ancestry website shows that he was entitled to a service medal for service from 1914. Hubert died in a French hospital on 26th February 1915 following an operation. Joseph Tandy Joseph (seen here on the left) was also the son of a carter called Lewis Tandy and his first wife Harriett. He had previously served eight years in the Army, mostly in India, when he recalled to 2nd Glosters. He was shot through the lungs and spine on 14th October 1915, dying of wounds on 28th October aged 34. Hubert Victor Thorne. We know that Hubert was a tailor employed by John Williams in what is now Gloucester House. His army record shows two dates of enlistment (30.9.16 and 17.5.16) and this may be because Hubert’s father appealed against the enlistment. His father wrote on 31st August 1916 “I am a tailor aged 67 years of age in failing health. My son who is the only child works in the same shop with me and assists in keeping the house together. He is the chief support of the home. Respectfully yours, George Thorne John St”. The Find My Past website shows that although he was enlisted in the 3rd Battalion Gloucestershire Regiment he also served in 21st West Kent Yeomanry Service. He was 18 years and eight months old when he enlisted and he was baptised on 27th October 1897 at St Mary’s in Thornbury, the son of George Thorne a tailor and his wife Lucy Ann. The 1911 Census shows that the family lived at 9 St John St and that although George Thorne was 62 Lucy Ann his wife was only 41 years old. The couple had had three children in their 21 years of marriage but only one had survived. This was Hubert who was aged 13 in 1911 and still at school. His record shows that after enlisting he was posted to France on 24 March 1917 with the 3rd Batallion Gloucestershire Regiment. His record shows only that he returned to England on 19th April 1919. Charles Herbert Underhill – was baptised in Thornbury on 19th August 1877 the son of Joseph and Louisa Underhill of Kington. The 1881 Census shows that the family lived at Kington and that Joseph was an agricultural labourer. Louisa was earning money for the family as a laundress. At the time of the Census the family had three children: Harry aged 11, William aged 7 and little Charles aged 3. Louisa’s widowed father James Williams aged 70 lived with the family. Louisa’s sister Sarah Williams aged 25 and a dairymaid also lived with them. The 1891 Census shows that the family continued to live in Kington on Kington Lane and that they now had another two children to care for. One of these was Thomas whose name appears below. 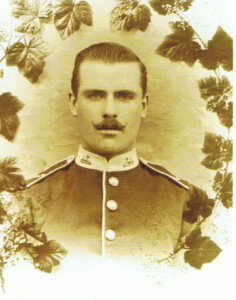 In 1893 aged 18 years and three months, Charles enlisted in the Gloucester Regiment. He was five feet four and a half inches tall . He weighed 129 lbs and had brown eyes and brown hair. He left the army in February 1911 and went into the army reserve. In 1911 census he was working in a coal mine in Llanwonno, Glamorgan. In the War he was called up and served until discharged unfit in April 1915. Another brother Robert Victor Underhill became a tram driver in Bristol and enlisted in December 1915. He was put on reserve and then from 1917 served mainly in Egypt with 13th Mountain Battery, Royal Garrison Artillery. The Census of 1911 shows that having left the army Charles had moved to Llanwonno in Glamorganshire where he was working as a timber assistant in a coal mine. He was mobilised on 5th August 1914 and on 6th August he was posted. He was discharged from the army on 26th April 1915 because he was “no longer physically fit for war.” His address was Thompson Villa, Ynysybwl near Pontypridd in South Wales. Thomas Ernest Underhill – he was baptised in Thornbury on 4th September 1887, the son of Joseph Underhill, a labourer and his wife Louisa. They lived in Kington. By the Census of 1911 Thomas Underhill was a boarder in Gelligaer Glamorganshire where he was working as a haulier in a colliery. 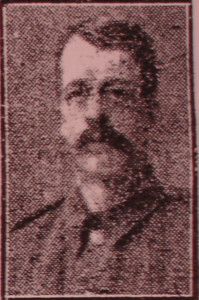 Thomas enlisted in Bargoed in Monmouthshire. He served as a Driver in the Royal Horse Artillery and Royal Field Artillery. He died in Italy on 1st November 1918 aged 30. The cause of death was influenza and he was buried at Giavera British Cemetery. After his death his family received the Memorial Plaque that was issued to the next of kin of all the British and Empire service personnel who were killed as a result of the war. These little plaques were made of bronze and bore an unfortunate resemblance to a large penny. They had a mixed reception as is natural in such terrible circumstances and whereas some families treasured them as a symbol of the sacrifice their family had made, others bitterly rejected them as a poor compensation for the loss they had suffered. We do not know the story of this death plaque but it is now held by Thornbury Museum and currently (2014) displayed there partly in tribute to all those who died. Albert Henry Walker. Albert was baptised in Thornbury on December 2nd 1883. He was the son of Walter George Walker and his wife Sophia. He was also the older brother of the below named Alfred Levi Walker. The 1891 Census shows that they lived in Eastland Hill Road. By the time of that census Walter and Sophia had had five children including Albert, then aged 7, and ‘Levi,’ aged 2. By 1901 only two children lived at home, Albert who had become a general labourer and his brother, Alfred Levi. He was working as a labourer in Caerphilly when he enlisted in the First World war aged 30. At that time he was said to five feet six inches and 138 pounds. Albert was initially serving in the 7th Wiltshires when he was sent to France in September 1915. It appears that he may have been wounded as he was discharged from military hospital in April 1917. In 1918 he was transferred to the Black Watch. His army record shows that by February 1918 when he was ready to be discharged from the army he was working in the sanitary department. He was demobilised on 5th April 1919. After the war Albert returned to live in Crossways. He died on 5th March 1921 and was buried in Thornbury aged 37. At the time of his death he was living in Crossways near Thornbury and he was working as a warehouseman. Alfred Levi Walker. 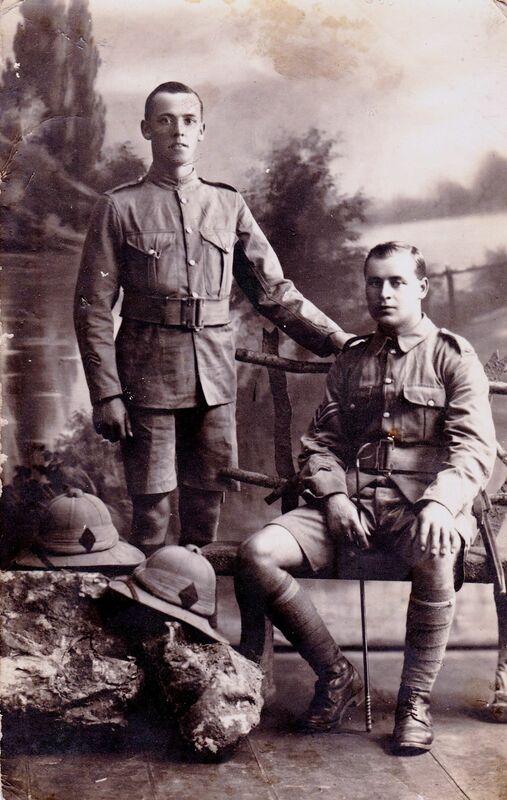 Alfred, shown in the photo on the left, was the youngest son of Mrs Sophia Walker and Walter Walker of Crossways. He was serving as a Private in 2nd Grenadier Guards when he was killed in action at Ypres on 10th November 1914. He was aged 25. Alfred had been in the Guards for three years and was on reserve when War was declared. Alfred is remembered on the Menin Gate at Ypres in Belgium. Ernest Webb (10959) – enlisted in Somerset Light Infantry at Taunton on 31st August 1914. Ernest was a labourer aged 22 years 4 months when he enlisted. He lived away from his father’s house at the Seven Stars. He was discharged from the army because he was “not likely to become an efficient soldier” on 10th November 1914. Length of service was only 41 days but his character was said to be “good.” He was the son of William and Clara Webb of Thornbury. On enlistment he was 5 ft 5 inches tall and 127 lbs in weight. He had a florid complexion, blue eyes and brown hair. Reginald Williams – the memorial at St Mary’s Church shows Reginald was serving as a Private in the 1/20th London Regiment. The Commonwealth War Graves website shows Reginald was aged 19 when he died on 1st September 1918. It adds that he was attached to the London Regiment from the Queen’s Own (Royal West Kent Regiment) and that Reginald had previously served in the Hampshire Regiment. Reginald was listed on the Vis-En-Artois Memorial. Reginald was born in Alveston in 1899, the son of Walter George and Sarah Ann Williams. The 1901 Census shows Walter was a brickyard labourer and the family were living at Rudgeway. Reginald’s family were living at Crossways at the time of his death. Robert G Williams – served in the Royal Army Medical Corps. On 11th July 1915 Robert was posted to the Balkans. 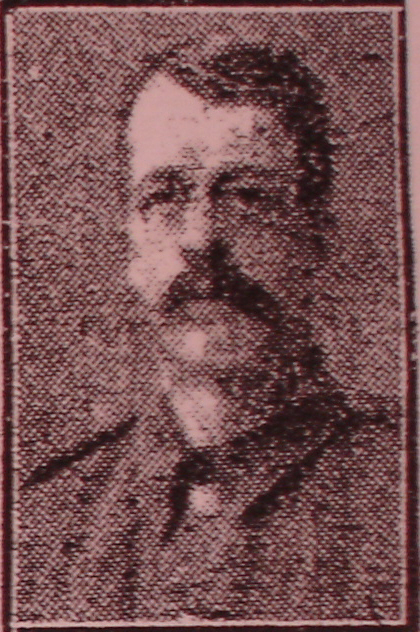 He was listed in the Roll of Honour that appeared in the Gazette on 25th December 1915. The Western Daily Press of 12th July 1916 has a list of the wounded that includes “Royal Army Medical Corps – Williams 26981 R.G. (Thornbury). His War Recod shows that he earned the Victory and British Medals (RAMC/101) and the 1915 Star (RAMC/16A).